In this article you will get the CBSE Class 9 Science, Tissues: Chapter Notes (Part-II). The notes prepared by the subject experts, are completed as per the latest syllabus for CBSE Class 9 Science. These chapter notes can be really helpful while preparing for the CBSE Class 9 Science Exam 2017-2018. This article brings you the CBSE Class 9 Science notes on chapter 6 ‘Tissues’ (Part-II) . These chapter notes are prepared by the subject experts and cover every important topic from the chapter. At the end of the notes you can try the questions asked from the discussed set of topics. These questions will help you to track your preparation level and get a hold on the subject. Animals move around in search of food, mates and shelter. Most of the tissues they contain are living. The structural organisation of organs and organ systems is far more specialised and localised in animals than in plants. They form the covering of the external surfaces, internal cavities and organs of the animal body. (i) Epithelitum covers most organs and cavities within the body. (ii) It also forms a barrier to keep different body systems separate. (iii) The permeability of the cells of various epithelia play an important role in regulating the exchange of materials between the body and the external environment. (a) Simple squamous epithelium: In cells lining blood vessels or lung alveoli, where transportation of substances occurs through a selectively permeable surface, there is a simple flat and extremely thin kind of epithelium which is named as simple squamous epitheliun. It is found in the lining of the mouth, oesophagus, lung, alveoli, etc. (b) Stratified Squamous Epithelium: The skin, which protects the body, is also made of squamous epithelium. Skin epilhelial cells are arranged in many layers to prevent wear and tear. Since they are arranged in a pattern of layers, the epitheliunim is called stratified squamous epithelium. (c) Cuboidal epithelium: This is cuboidal in shape and forms the lining of kidney tubules and ducts of salivaiy glands. In some cases a portion of the epithelial tissue folds inward to form a multicellular gland. This is called glandular epithelium. It performs a function of secretion and absorption. (d) Columnar Epithelium: Where absorption and secretion occur, as in the inner lining of the intestine, tall epithelial cells are present and are named as cohunnar epithelium. In the respiratory tract, on the outer surfaces of epithelial cells there are hair like projevtions called cilia. These cilia can move, and their movement pushes the mucus forward to clear it. This type of epithelium is named as ciliated columnar epithelium. They are specialised to connect various body organs. Blood (plasma), bones, Cartilage. ligaments and tendons etc. Plasma: The fluid (liquid) matrix of blood is called plasma. Plasma is a yellowish liquid like material. Bones: It is also a connective tissue that forms the framework that supports the body. It is a strong and nonflexible tissue. Ligaments: Two bones are connected to each other by a connective tissue called the ligament. This tissue is flexible or elastic in nature. Tendons: Bones are connected to muscles by another type of connective tissue named as Tendons. Tendons are fibrous tissue with great strength but limited flexibility. Cartilage: Cartilage is another type of connective tissue which has widely spaced cells. The solid matrix of this tissue is composed of proteins and sugars. Cartilage of ear can be folded. (a) Areolar tissue: They are found in the skin and muscles, around the blood vessels, nerves, etc. (b) Adipose tissue: It is found between the internal organs and below the skin. It act as an insulator. Main function of muscular tissues is to provide movement to the body. 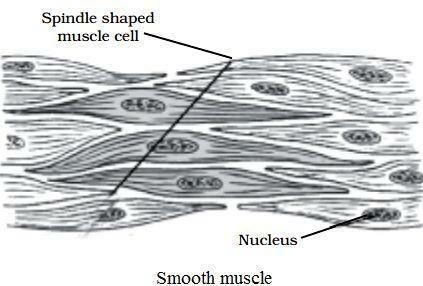 (a) Striated muscles or skeletal muscles or voluntary muscles: These muscles are also called skeletal muscles as they are mostly attached to bones and help in body movement. Cells are cylindrical, unbranched and multinucleate. (b) Smooth muscles or involuntary muscles: They are found in the iris of the eye, in ureters and in the bronchi of the lungs. 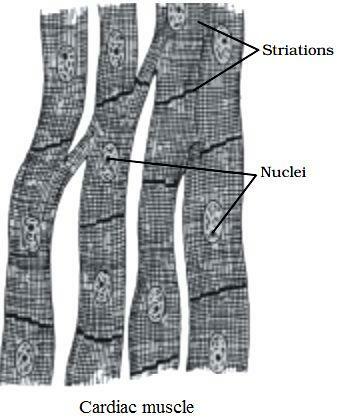 Cells are long, spindle-shaped and possess a single nucleus. (c) Cardiac muscles or involuntary muscles: They help in rhythmic contraction and relaxation of the heart. Cells of the nervous tissue are highly specialised for being stimulated and then transmitting the stimulus very rapidly from one place to another within the body. Neuron: Cells of the nervous tissue are called neurons. A neuron consists of a cell body, an axon and a dendrite. Q1. Which tissues are called covering or protective tissues? Q2. Where do you find simple squamous in an animal body? Q3. What is the shape of cuboidal epithelium? Where do we find these tissues? State one of their main function. Q4. What type of epithelium tissues are found in respiratory tract and in intestinal lining? Q5. Name the fat-storing tissues? Where are they located?